Join us for our next BBS Dance Party: The Valentine Vixen! Learn a sultry burlesque dance number in this 2-hour workshop. 18 years old and up. *MUST RSVP: arise2thetop@yahoo.com When: Sunday, Feb. 10th Time: 3:00 pm - 5:00 pm At: Arise Choreography (2617 W. Slauson Ave, LA, CA 90043 Rate: $35.00 per person (service rate applied to cc). *Student discounts available with valid student ID. 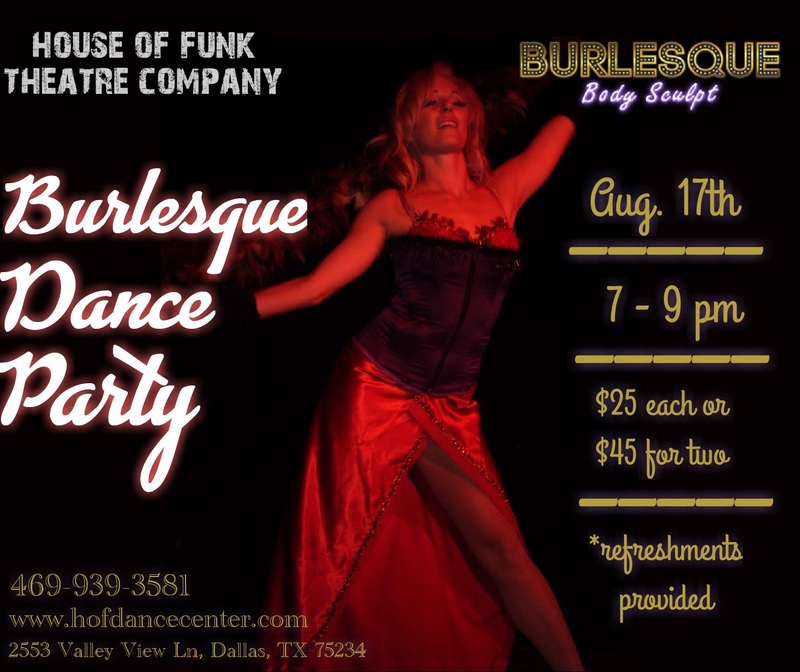 We're bringing you another Burlesque Dance Party in Dallas! Friday, August 17th, starting at 7 pm At: HOF Dance Center Visit the flyer below for more info! It's the last chance to catch our spring special! Burlesque class starts at 7:30 PM at House of Funk in Dallas! No class this week. Classes return next week on Thursday nights, 7:30 pm, at House of Funk in Dallas! 7:30 pm At: HOUSE OF FUNK in Dallas Get your burlesque on! Class tonight! 7:30 PM. Available in Dallas only at House of Funk!